This is a demo version with limited amount of lines in the final file. Full paid version: https://www.mql5.com/en/market/product/5508. 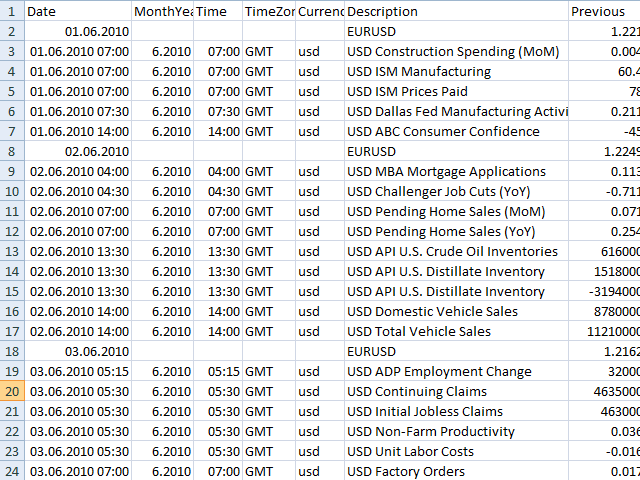 Each column contains data on a particular macroeconomic indicator. Empty column cells are filled with the previous value. First, the initial document that will be converted into the table should be prepared. This should be a CSV table containing seven columns with the lines containing data from an event calendar. Previous - this indicator's value or the event's outcome given in the total numerical form. The names of a source file and a final document should be specified in the settings' dialog window of the script. In order for the data to be processed, the source file should be preliminarily placed to terminal_data_directory\MQL5\Files. The final one is also generated there. The code contains the alerts allowing you to see the current stage of the script. "8" alert shows that the work is complete and the file is ready. The obtained table is used for multiple regression analysis. 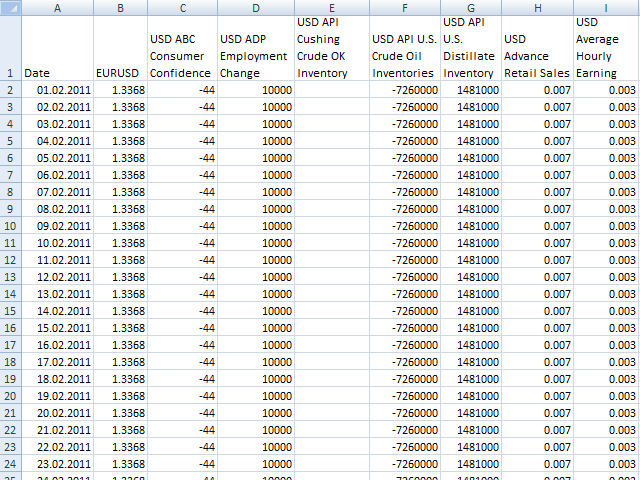 reveal factors affecting the symbol's prices using statistics processing software (Statistica).